The purpose of this article is to serve as a general strategy guide with tips and advice that you should follow when attempting to win a calzone eating challenge. These strategies can also be applied during stromboli challenges as well. For those of you who don’t know, a calzone is basically a “half-moon shaped stuffed pizza” and a stromboli is basically a “calzone-like enclosed sandwich wrapped in pizza dough.” A stromboli is straight rather than curved. There aren’t too many calzone or stromboli challenges available around the world, but you may encounter one every now and then. There are two major types of calzones, and the most popular type is the typical “pizza-like” calzone filled with pizza-oriented toppings, marinara sauce, and various cheeses. The second type is a breakfast calzone which is a lot less common, filled with various omelet-oriented toppings, eggs, and cheeses. 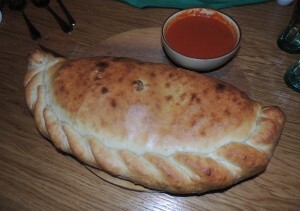 Most calzone challenges feature just one large calzone, but every now and then you’ll encounter one that includes a small side item. Most restaurants give you a bowl of sauce on the side to dip your crust/bread in too. Even though there are many different variations you may encounter, the basic strategy you need to have remains similar for each one. Before we go into the specific strategy details for winning a calzone challenge, make sure you have read and understand our Basic Strategy For Winning A Food Challenge article. It’s full of 14 different strategy tips that won’t be included in this article, which you need to understand before attempting a calzone challenge. Please start off by watching our very informative How To Win A Calzone Challenge video so that you can visually see all of our different tips put into practice during an actual calzone eating challenge. For this video, I attempted The “Beast” Breakfast Calzone Challenge at T-Dub’s Pizzeria and Pub in Frankenmuth, Michigan. During this challenge, I had to finish a five pound breakfast calzone which was filled with a 14-egg meaty “Coronary Omelet” in less than 1 hour. Winners get the meal free and a t-shirt proclaiming their victory!